Gold City has been one of the most popular southern gospel groups for over thirty years. So, when an event is designed to bring one of the top award-winning combinations of that group PLUS the groups that those former members have started since they left, well, we knew we had to be there! The Crosspoint Community Church in Gadsden, Alabama was the venue on a beautiful April evening. The large church was filled with about 1,000 very enthusiastic fans and the singers certainly did not disappoint! Unfortunately, video recording was not allowed at the event. The program was opened by Amber Butler of Singing News, who introduced the emcee, Ron Foster. Ron broadcasts a Southern Gospel program every Sunday morning on WZZK – 104.7 radio station in Birmingham and is a fixture at southern gospel concerts in the area. I’m Living By Faith – you would expect any group that has Jay Parrack in it to be great and they were!! I Call Him Lord/I Know a Man Who Can – This arrangement started off with a track and then they performed an a capella section of I Know a Man Who Can before finishing with another chorus of I Call Him Lord. This is such a beautiful, beautiful song and these three voices were incredible on the very slow, a capella ending. Just breath-taking!!! Glory Road – Always a favorite at concerts and this one didn’t disappoint either! There were quite a number of folks standing during the reprise and there was lots of clapping when Jay hit those super high notes! Beulah Land – This one featured Darren. They invited the audience to sing along (and Jay directed) during one of the choruses. Too Near Home – Jay gave a humorous intro about Vestal before this song! Then I Met the Master – I’ve seen Jay a few times in the last year or two and he has sung this every time. It’s such a great song of testimony! Jonathan and Jordan Wilburn were next. Wilburn & Wilburn has had an amazing first year with nominations for several Singing News Fan Awards and even a Dove nomination for Country Album of the Year for their first Daywind project, Family Ties. I’m Gonna Move – I had to laugh at this one! Jonathan was really keyed up and you couldn’t have kept him from moving!! More about this later! It’s a Shore Thing – This is a Ronnie Hinson song with nautical references throughout. Had It Not Been – Jordan does a beautiful job on the verses on this one and their harmony on the choruses is just beautiful! You’ll Still Be There -This is what they call their “bluegrass” song! It has a good message presented with a lot of humor along the way! Jesus Will – This is a marvelous song about God’s faithfulness. It’s their current radio single. Mama – Jonathan was featured and his mom and his mother in law were both at the concert, which made the song even more touching. Mary, Did You Know – Jordan took the lead on this one. Let’s All Go Down to the River – This was a very energetic close to their set! The Mark Trammell Quartet took the stage next and changed the pace immediately! Gentle Shepherd – They had to restart this song because Mark’s mic wasn’t on but Mark is unflappable and made several jokes about the situation! Eric has such a clear, pure voice on the melody of this pretty song! How Long Has It Been Since You Heard an Old Convention Song – The section with Pat on the melody is really good! How Big Is God – What can you say? Pat Barker owns this song!! Wedding Music – Of course, they got an immediate crowd response when they started this much-loved song! 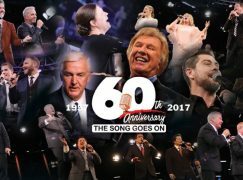 Calvary Medley – includes I’ve Been to Calvary, The Old Rugged Cross Made the Difference, and At Calvary – This is a big song with the typical Lari Goss full orchestration and production. I’m Standing on the Solid Rock – This is a great song from a long time ago by the Florida Boys. Just good ole quartet sangin’!!! Statue of Liberty – I don’t remember ever hearing them sing this song in concert but it’s on their Treasures album which they have re-mastered since Eric’s return to the group. Gold City was up next. Like the other groups, they performed pretty much a somewhat shortened set of songs they are currently using on their tour. I Cast My Bread Upon the Water – As always, a great opening song. Peter, James and John – This song has surely taken off for the group! Rainbow of Love – Of course, Tim Riley rules on this one! Near the end he really went into the basement and nailed a low G.
We’ll Soon Be Done – It seems like several groups have this on their programs right now but Gold City gives it a really traditional treatment, especially Tim’s bass part! Truth Is Marching On – Such a great message for today’s world. I Have An Anchor – Jerry was featured on this one and pianist Bryan Elliott really nailed his part between verses! Lord of Life – I hadn’t heard this one from the new CD (Somebody’s Coming) performed before and I just loved it! This was a perfect song especially for the Easter season. When He Blessed My Soul – This is a great song to feature both the tenor and the bass! Folks were standing on the reprise and having such a great time! 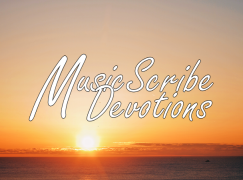 Oh, What a Savior – This must be one of Dan Keeton’s favorite songs because he sings it so well and with such conviction. After an intermission, it was reunion time with Jay, Jonathan, Mark and Tim!!! The other groups seemed to sing for about 30 minutes each but this group sang for an hour – which is, after all, what people really wanted and came for! From Jim: This was my first time to see this lineup. WOW. These guys were born to sing together. The chemistry among them is perfect, and their humor just works when they pick at each other (which is OFTEN). I’d never heard anybody call Tim “T-Bone”. And when it comes to stage presence and energy, Jon Wilburn wrote the book. I can’t say enough about how much I enjoyed seeing The Gold City I fell in love with years ago, and I guess the biggest compliment I can give them is, I hope I get to see them again. 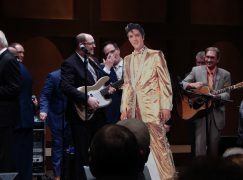 From Diana: Jim may know more of the songs they sang than I do, but let me just say, they were all crowd favorites and the gentlemen seemed like they enjoyed being together so much! There was so much camaraderie and joking around with each other that was just delightful and fun. And the audience responded to them with a huge helping of affection and appreciation. You’re At the Well – They really hit the ground running with this upbeat song that had the audience clapping from the start! Pray – They switched gears pretty quickly on this slower, meditative song, with Tim featured on one of the verses. In Time, On Time, Every Time – They didn’t keep the tempo slow for long with this peppy one. Show Me the Cross – Mark was featured on this one! I’m Not Giving Up – Jonathan introduced this one and the crowd was crowd was clapping from the beginning. They ended up doing two reprises! And Jay hit a REALLY high not at the end. It was such a shame we couldn’t record it!!!! Hide Me Behind the Cross – Mark introduced the song which then featured Jay on this slower song. Higher Than the Moon – Jonathan just couldn’t be still, even trying to get a chorus line going at one point!! Bless Mark’s little heart, he just can’t dance! I Can Tell You the Time – Love the bass singing on this one, too!! It’s Still the Cross – At this point, they brought Danny Riley up to the stage and he, of course, did a great job! 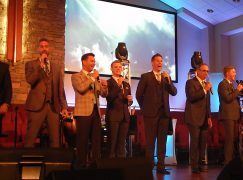 God’s Building a Church – These men sang this and all of the songs as if it had just been last week that they had sung them together. He Said – More fun times with Jonathan! Calvary’s Hill – Mark did a wonderful job on this story song. Get Up, Get Ready – The fitting finale for the evening that nobody wanted to see come to an end! Heritage House Promotions is planning to do several more of these 24K concerts in other states. Be watching their website for news as future dates are announced.